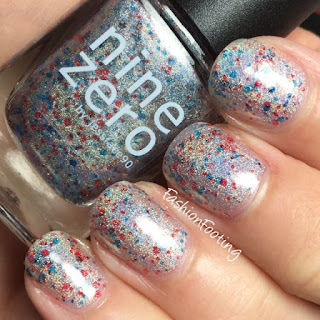 Today's post is a quick one, but I have two beautiful polishes to show you from Nine Zero Lacquer. First, I'll share the Polish of the Month for June 2016. This is a light purple linear holograph. 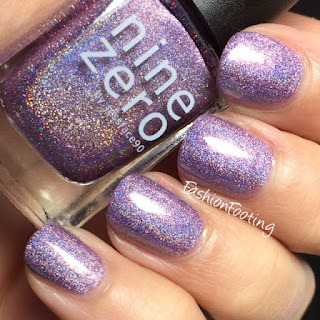 By now you should know that Nine Zero has just about perfect formulas, especially for holos, and this was no different: 2 easy coats, plus topcoat. Patriot is the Limited Edition polish to celebrate the 4th of July. It is a silver holographic base with semi-transparent red and blue glitters. This was 3 coats, plus topcoat. I love this and I want it in every color combination possible, mmmmkkay? 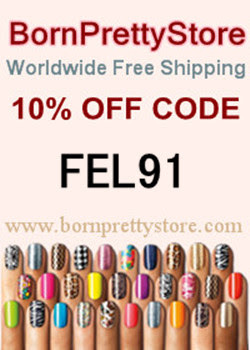 These polishes are both available now! I'm not sure how long Patriot will be around but I'm guessing not long after the 4th of July, but you should order it now so you can wear it on the 4th, duh!